Indian government has decided to dedicate a memorial of former President of Indian Dr. Abdul Kalam to the nation on July 27 in Rameswaram in Tamil Nadu, where the missile man was born in Muslim fisherman community and spent his school life and rose to decorate the Indian military establishment and presidency with honor and dignity. On Jul 28, 2015 former “People’s President” Dr. Abdul Kalam, known as the missile-man in military establishment, became the national centre stage to become an Indian icon. Wedded to science and technology, Kalam led the scientific team that developed missiles able to carry India’s nuclear warheads. 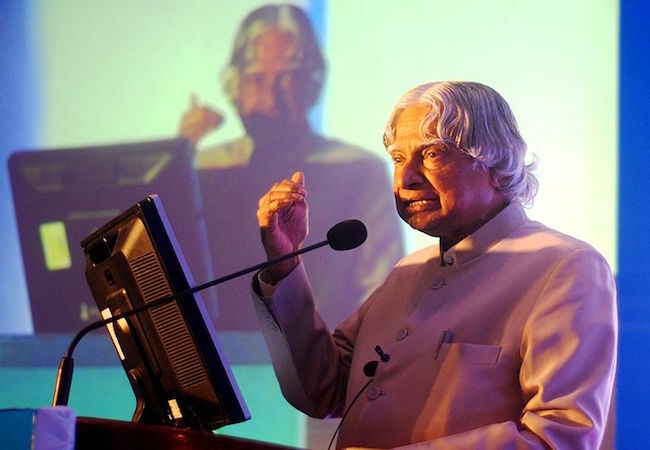 He was committed to service to nation which he considered above his own religion or personal ambitions, teaching the youth, educating the children on positive thinking, Professor Kalam collapsed while delivering a lecture at the Indian Institute of Management, Shillong. He lived and died for India and India was his passion. Dr. Abdul Kalam has been an inspirational figure even after demise for everyone, whether a child, youth or adult. Soon nation will see a national memorial in his honor and his statue in his home town Rameswaram. A team, comprising officials from the Ministry of Defence and Indian Coast Guard, on July 18 visited the spot in Rameswaram where the mortal remains of former president APJ Abdul Kalam have been laid to rest to oversee arrangements made for installation of his bronze statue on July 27 by Indian premier Narendra Modi. Additional Secretary, Defence Ministry, Ramakrishna Rao told reporters in Rameswaram in Tamil Nadu that the statue would be unveiled on July 27, to mark the first death anniversary of the former president. A library and a museum would also come up at the site, where a memorial for the missile technologist would be built, the official said, the housing quarters for memorial staff would also be constructed there. Mandapam Coast Guard Commander Ramamohan Rao and Abdul Kalam’s grand nephew Sheikh Saleem were also present during the inspection. Indian Prime Minister Modi, who announced the memorial and statue of Kalam, said he holds Kalam in high esteem as he respects him as true son of India. Paying rich tributes to ‘people’s President’ APJ Abdul Kalam on his 84th birth anniversary, on October 15, 2015, Narendra Modi had said a memorial to honor him and inspire future generations would be built in his birthplace Rameswaram, which will developed as an AMRUT city. PM Modi exhorted the scientific community, especially the youngsters, to come up with innovations to ease the common man’s life, drawing inspiration from Kalam who had built great institutions from scratch. He mentioned several vital sectors where innovation was essential, including cyber-security, housing for all, river-linking, enhancing agricultural productivity, blue economy, and ‘zero-defect, zero-effect’ manufacturing. Describing Bharatratna Dr Kalam as a “Rashtra-ratna” before being a “Rashtrapati”, Modi, who was speaking at a function organized by DRDO in New Delhi said the former President always looked for “challenges” and his life is a source of inspiration for all Indians. The Prime Minister said that a memorial for Dr Kalam would be built at Rameswaram, to inspire future generations. He added that government has already acquired the land for the memorial and a committee of Ministers has been set up to discuss modalities in this regard. Urban Development Minister Venkaiah Naidu said Rameswara would be converted into AMRUT (Atal Mission for Rejuvenation and Urban Transformation scheme) city. The Prime Minister said that while most people look for opportunities in life, Kalam always sought fresh challenges to overcome. He recalled how he worked closely with Kalam during the post-earthquake reconstruction work in Kutch. Recalling that Dr Kalam wished to be remembered as a teacher, the Prime Minister said that the former President was well aware of the importance of nurturing future generations. On Dr Kalam’s birth anniversary, “one must explore how we can encourage innovation in India,” Modi said. Speaking about various sectors, PM Modi hoped that India can turn itself into one of the main hubs for cyber security, which has become a global concern. PM Modi said Dr Kalam had not only risen from humble beginnings to the highest office in India, but had also built great institutions, virtually from scratch. He said everyone should draw inspiration from his example. Dr Kalam had child-like qualities and he always made sure to interact with youngsters and to inspire them. On January 29, 2016, a black stone statue of former president APJ Abdul Kalam was unveiled at Chandipur on sea beach near the Integrated Test Range (ITR), considered as his ‘theatre of action’, 15 km from Balasore in Odisha. “I feel proud to unveil the statue of Bharat Ratna APJ Abdul Kalam who dedicated his life for nation building,” Odisha Chief Minister Naveen Patanaik said while unveiling the eight feet high statue of the former president. Tourism Minister Ashok Chandra Panda said the government is keen to develop a tourist circuit comprising Chandipur, Dagara and Talasari coastal beaches under Balasore district. Initial fund has already been allocated for the purpose. Dr Kalam had a long association with Balasore district. Under his guidance and leadership the present Integrated Test Range, a unit of Defence Research and Development Organisation (DRDO), was developed to a full-fledged test range. In 2012, while addressing school students as former president at the golden jubilee celebration of a high school in Balasore district on January 7, Dr Kalam had then said, “I spent nearly a decade in Chandipur (ITR) during my service tenure in DRDO in the missile development programme. Chandipur is a beautiful place, the atmosphere is calm and serene. We have a beautiful lake in the ITR and hundreds of birds visiting the lake make it more beautiful.” Dr Kalam had last visited the ITR campus to inaugurate an international seminar on range technology held on November 28, 2006. Dr Kalam, known as the father of India’s missile program, was President from 2002 to 2007. He died of cardiac arrest on July 27 this year.